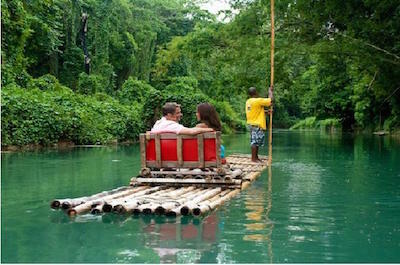 Here is our list of fun things to do in Ocho Rios, Jamaica! Get immersed in the rhythms of Reggae music in Ocho Rios! This thrilling Jamaican city offers a vibe like no other. Soak up the culture and learn about Bob Marley, taste Jamaican coffee and world famous Rum. Then get out into the countryside and experience stunning waterfalls, beautiful lagoons, caves and hidden coves. 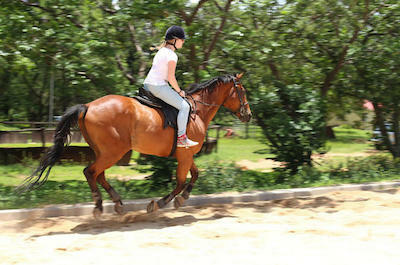 Sports lovers can hike, climb, swim and horse ride. The family can bond on a bike ride down a magnificent mountain and you can make dreams come true when you swim with the dolphins There are many fun points of interest in Ocho Rios and well as some quite interesing Ocho Rios activities that beg to be explored! 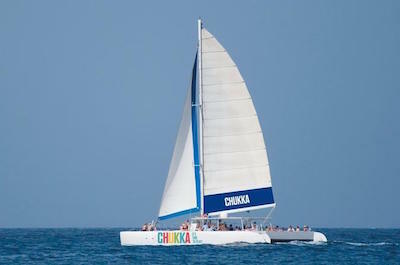 There are so many things to do in Ocho Rios when it comes to sailing and cruising its sensational waters. You can hop aboard a spacious catamaran to go coral reef snorkeling on route to where the breathtaking Dunn's River Falls meets up with the sea. 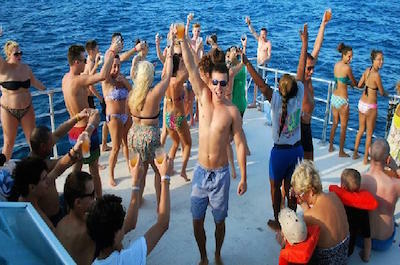 Or take a sunset cruise to party away on rum cocktails and authentic Reggae rhythms while marveling at cliff-divers near the famous Rick's Cafe. If you have had enough of the hot Caribbean sun, why not try the once-in-a-lifetime night cruise along the Luminous Lagoon, taking a dip in the shallow, shimmering waters. For a great combination, combine a sunset cruise with a visit to Dolphin Cove. A horseback riding adventure is definitely on the list of things to do in Ocho Rios. Take a unique equestrian ride through the woodlands, mangroves and onto a deserted beach. Surrounded by coconut trees, you'll pass through an old sugar plantation, historical castles and archeological excavations, and learn about the Taino Indians' culture and beliefs in the time of Christopher Columbus. The main feature of the Heritage Beach Horse Ride, though, has got to be when you ride on into the ocean and dash through the waves on horseback! Whether you're a novice or an experienced rider, the guides will provide basic training and safety gear, ensuring your absolute pleasure from start to finish. 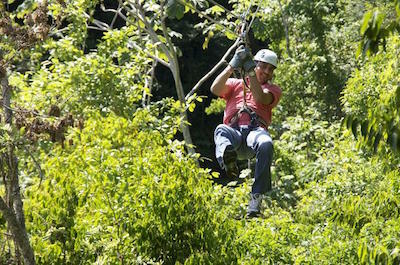 If you're looking for adventurous things to do in Ocho Rios, ziplining is an action-packed must! Harness up at H-Evans Scent, the forerunner of ziplining adventures in Jamaica, and choose from five fantastically unique and thrilling lines. Some of the popular options include The Runner, you'll kick off by having to run and jump off a cliff and The Screamer, a giant 180 degree swing. This unique zipline allows three brave friends to fly in tandem! The Canopy Tour boasts breathtaking views of Cranbrook Forest's flowering trees with nine zipline traverses. You can also opt for a thrill-seekers' upgrade on the Good Hope Estate tour, which couples their historical tour with ziplining. There are plenty of things to do in Ocho Rios, like taking an inner-tubing adventure along Jamaica's White River and Rio Bueno. With these rivers' unspoiled waters and bountiful vegetation, river tubing is the perfect activity for nature-lovers looking for that tropical paradise experience. Just as pleasurable for the adrenaline-junkies, they also sport exhilarating class-2 rapids! Tours are well planned with safety lessons and all equipment is supplied. They are ideal for all ages and levels of fitness. 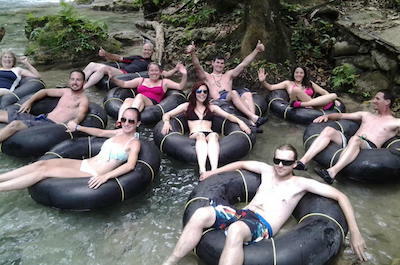 Many tubing tours incorporate other exciting activities too, including cave exploration, rope-swinging, hiking, shopping and riverside massages. 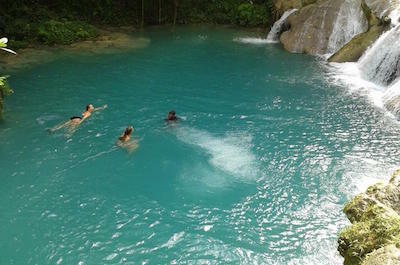 Also, take in the spectacular natural landmarks such as Reggae Hill, Blue Hole, and the magnificent Dunn's River Falls. Looking for things to do in Ocho Rios? 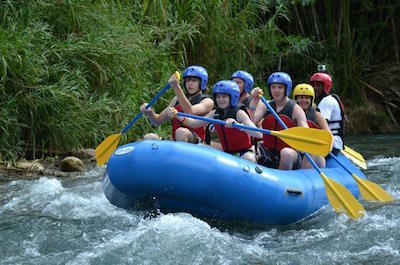 Climb aboard a Jamaican river-rafting adventure! Whether you choose the rushing rapids of Rio Bueno, known for its crystal blue waters, the sun-kissed White River, or a trip down the tranquil and scenic Martha Brae River, climb aboard a traditional bamboo raft for a ride with unparalleled on-the-water views. Keep your eyes peeled for indigenous wildlife as your experienced and enthusiastic guide shares interesting details of the native fishing communities and the area's thriving flora and fauna. Safety is not an issue as you'll be provided with the necessary briefing and gear. For more of an adrenaline rush, experience the rushing rapids on a modern-day blow-up river raft. Great for the whole family with a guide on board! If you are looking for cultural tours like no other, there are so many things to do in Ocho Rios to ensure a memorable experience. The rich Rastafarian culture would be incomplete without the legendary Reggae star, Bob Marley. If you are an enthusiastic fan, be sure to hop onto the 'Irie' Zion Bus or take a Music History tour into the homeland of Reggae music, Kingston, where you can set foot in the legendary Trench Town. Record music in a studio, you get to keep the recording as a souvenir and mingle with the laidback dreadlock locals! For a countryside view from a horse-drawn carriage, Good Hope Estate offers 2000 acres overflowing with rustic history and indigenous beauty. You'll never run out of options if you're searching for day-filled things to do in Ocho Rios. Choose from a wide variety of highlight tours, accompanied by activities like White River tubing, horseback riding and swimming and climbing the giant terraced waterfall of Dunn's River Falls. There are multitude of day trips combining action-packed activities with culturally rich visits to famous local places, such the Bob Marley Mausoleum, Appleton Rum Factory or Blue Mountain coffee plantations. Other popular activities among these excursions includes ziplining through canopies of tropical wetlands and floating down-river aboard a 30 foot family-friendly bamboo raft. There's so much to do and see, you'll need more than just one day to squeeze it all in! If you're in the mood for an adventure through the Jamaican outback, there's lots of things to do in Ocho Rios. Once you're safety-briefed and fitted with helmets, start up your ATV engines for an off-road dirt kick-up through rugged trails, woodlands and historic sugar plantations. Soak up the incredible Caribbean Sea views and, if you're feeling daring, dive off a cliff into the refreshing waters. Sample delicious local fruits as your guide shares stories of their secret medicinal properties. If you don't feel like getting dirty, book yourself a spot on a Jeep Safari tour and take a leisurely drive through the countryside, stopping at quaint villages, and then moving on to the breathtaking 600 foot waterfall cascades of the magnificent Dunn's River. If you thought horse-riding was fun, discovering Jamaica on the back of a camel is definitely the thing to do in Ocho Rios! 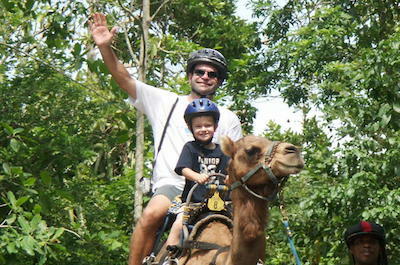 Go on an Outback Camel Adventure, one of the best tours in Ocho Rios, the first and only camel trekking safari of its kind in Jamaica. These friendly, docile animals will soon creep into your heart as you saddle up and trek through an 18th century plantation teeming with an assortment of tropical crops. The stop at Sir Harold's Viewpoint is a feast for the eyes and on a cloudless day, there's a chance you'll be able to see Cuba on the horizon. Before the tour ends, grab the opportunity to feed the ostriches and catch crazy Farmer Joe scaling a 30 foot coconut tree. Wondering what things to do in Ocho Rios that'll get your heart pumping and give you an experience to remember? 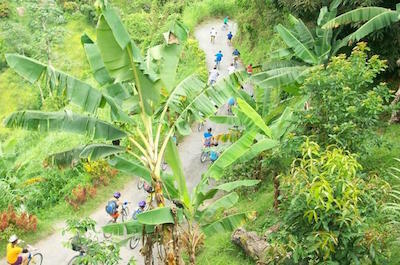 Go biking through Konoko property's craggy terrain with panoramic views, testing your endurance on some of the uphills. Blue Mountain offers a slightly less strenuous Downhill Bike Tour option, where you will start off with a coffee-roasting demonstration and tasting of the world-renowned Blue Mountain Coffee, followed by a leisurely 2.5 hour downhill ride with exceptional views of the rainforest and misty slopes. On any of these tours, you'll reach your final destination at the gushing falls for a refreshing splash in the waters, a traditional coconut water drink, a traditional meal and a relaxed stroll in the beautiful natural surroundings. 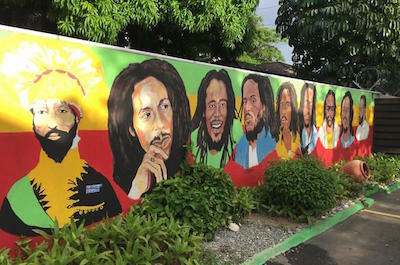 One thing to do in Ocho Rios that you simply cannot miss out on is taking a Rastafarian music tour through the life of Robert Nesta (Bob) Marley, the legendary peace activist and king of Reggae. Tucked away deeply in Jamaica's mountainous rainforest, Nine Mile is the tiny village of his birth, childhood and final resting place. Make your pilgrimage up to the Mt. Zion, the inspiration for many of Marley's songs, and visit the nearby Ethiopian church where his body rests with his guitar. 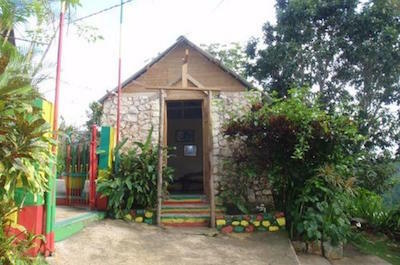 Don't miss an opportunity to stroll through the Bob Marley Center and Mausoleum where walls are lined with handwritten fan notes to 'The Prophet' and pay homage to 'One Love, One Heart'. 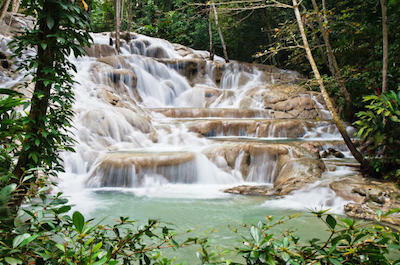 If you are one for spectacular scenery, the thing to do in Ocho Rios is most certainly a trip to Dunn's River Falls. A mighty, 1000 foot waterfall just outside Ocho Rios, Dunn's River Falls is considered one of Jamaica's most popular landmarks. The waterfall is a rare living geological phenomenon, since it constantly regenerates itself from the river's travertine rock deposits, and is one of its kind since the waters pour directly into the Caribbean Sea. James Bond fanatics will also appreciate the familiar scenery from Cocktail and Dr No! 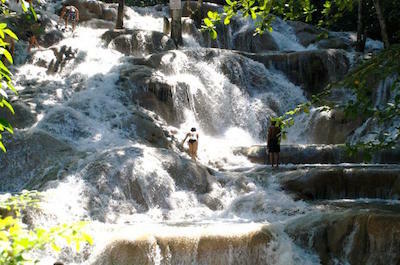 A premier Jamaican attraction, the new Dunn's River Falls Park offers modern facilities and loads of Ocho Rios activities, all the while staying true to its magnificent tropical setting. Just when you think there can't be more things to do in Ocho Rios, you're in for an unbelievably rare experience! Martha Brae River is world famous for its enchanted Luminous Lagoon, where at night the water glows bright hues of greenish-blue. Put your hand in the water and Ð magic! Ð your skin and everything around you will be glowing as well! The extremely rare bioluminescence is due to the mixture of the Caribbean's salt water and Martha Brae's fresh water, combining with the nutrients of the red mangrove trees. The Martha Brae River is also home to bamboo river-rafting, one of the best ways to explore Jamaica's tropical inland and unwind in true Caribbean style. 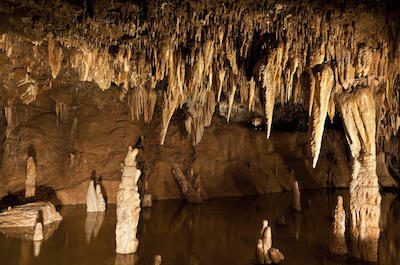 One of the most exciting things to do in Ocho Rios is taking a journey into the underworld of Green Grotto Caves. Surrounded by lush vegetation, enter into the historically rich limestone marquee that has been known over the centuries by many names, such as 'Runaway Bay Caves' because of its reputation of being an escape plan for Spanish runaway slaves in the 1600s, and 'Rum Caves' for its use as a secret storeroom for the Jamaican government's rum barrels during WWII. The mysterious green cavern is worthy of its world-class status, boasting unique stalactite and stalagmite rock formations, overhead ceiling pockets filtering ambient light, intimate chambers and a crystalline subterranean lake! Daredevils will find Mystic Mountain the thing to do in Ocho Rios. Take a trip up its 700 foot peak, and take your pick of three thrilling ways to make your descent through the tropical rainforest. Try a bobsled ride down the 3280 foot winding mountain track. 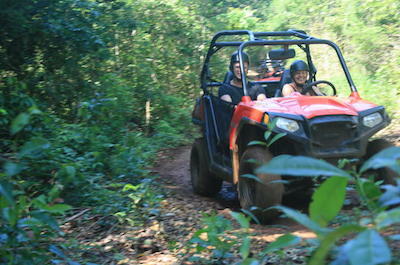 Determine your own pace, go full throttle for an adrenaline boost, or take it easy and relish the scenic views of the rainforest and Caribbean Sea. There are the Sky Explorer, chairlift, and zipline options too, which carry you midair through the heart of the lush forest canopy. At the end of these courses, you'll be lifted back on a tramway, get ready to take on the next challenge! One of things to do in Ocho Rios is taking a day trip to one of the longest and most impressive mountain ranges in the Caribbean. Over 7000 feet above sea level, the Blue Mountains is a sight for nature-lovers to behold. 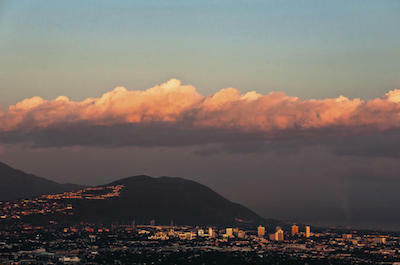 Choose from a privately guided tour to a downhill biking adventure, coupled with sightseeing and interactive opportunities such as coffee roasting demonstrations and tastings of the famous Blue Mountain coffee, dipping in the clear waters of the secluded Mountain Dew Waterfall, or viewing the 17th century Anglo-Spanish Rio Nuevo battle site. Admire the misty tropical rainforest's vast array of flora and fauna, spotting the Giant Swallowtail, the largest butterfly in the Americas, exotic birdlife, and over 500 wildflower species. 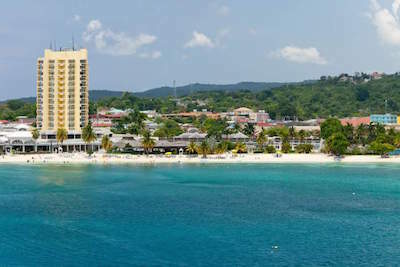 Looking for oceanfront things to do in Ocho Rios? No tropical getaway is complete without spending the day on a white sandy beach soaking up the Caribbean sun and enjoying shoreline cocktails! 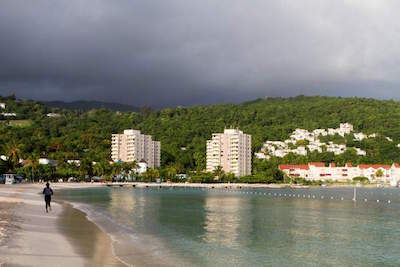 Stretching out along the east of Ocho Rios Bay, and just off Main Street, Turtle Beach is the largest seaside attraction in this coastal town. With a wide variety of water sports, like scuba diving, jet skiing and sea kayaking, there's every chance to get the heart pumping and skins bronzed. If you're not particularly fond of action, just relax under the palm trees or an umbrella, available for hire, taking in the exotic vibe while being served food and drinks on the beach. 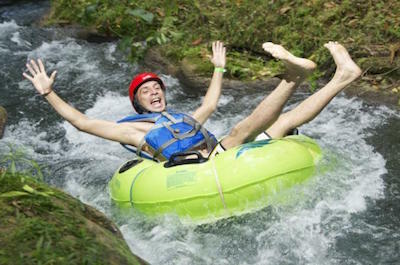 Not far from the town's bustle, here is one thing to do in Ocho Rios that will leave you with memories of a lifetime. 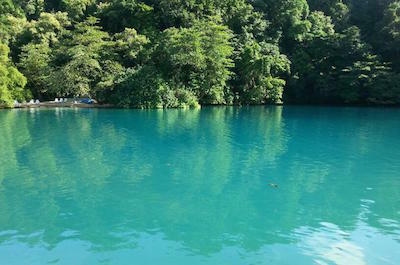 Until recently, Blue Hole was one of Jamaica's best kept secrets. 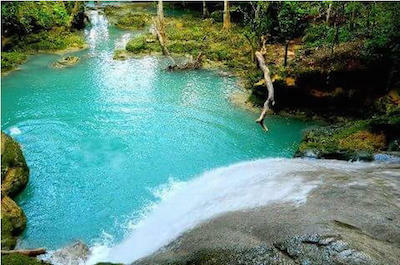 Also locally known as 'Irie Blue Hole' or 'Secret Falls', this now-popular water attraction will take your breath away with its immaculate blue waters. At the swimming hole, live on the wild side with vine swinging. Then only a 7-minute walk from the hole, the falls are great for cliff-climbing and jumping. Take your guide's advice, though, on the safest spots in order to avoid slippery rocks and shallow waters. Experience utter contentment relaxing on bamboo benches at the foot of the cascading waterfall, taking in the tropical splendor. With so much natural tropical beauty, your choices of things to do in Ocho Rios are endless. 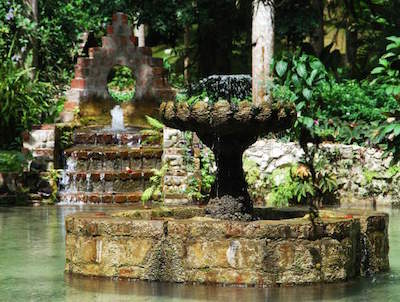 Located at Shaw Park Estate, the Coyaba River Garden is a colonial-style home surrounded by serene, authentic water gardens. Sit under the shade of giant cedar and banyan trees while drinking a cup of homebrewed Jamaican coffee or rum, all the while admiring the meandering streams and eye-catching Mahoe waterfalls. Pop into the Museum of Island History, which focuses on the forgotten cultures of the Caribbean's first indigenous people, the Taino and Arawak Indians. Also on the estate is a natural aquarium sporting a variety of fish and turtles, as well as the Ysassis Lookout Point, which offers spectacular views of the Ocho Rios Bay. At a loss for things to do in Ocho Rios. Don't fret, the magnificent ambiance of Fern Gully's rainforest canopy will be sure to impress. Driving through the astoundingly overgrown tunnels of bountiful fern species, it's not hard to see why this Jamaican attraction is so renowned. With tropical green overgrowth, tropical birds of paradise and prolific waters overflowing into canyons and gorges, this narrow winding thoroughfare stretching through the heart of Jamaica is a gorgeous way to pass the hours. If you have time and extra cash with you, support the roadside vendors or travel to the topmost south end of Fern Gully to the local jungle den venue for an eclectic Rasta experience and traditional cuisine. If you're looking for things to do in Ocho Rios, or in its nearby surrounds, consider taking a full-day sightseeing tour to Port Antonio. About 2 hours from Ocho Rios, the laidback 'Portie' is well known for its banana and coconut trading and is well worth the drive. Popular sights and activities in this area include the Blue Lagoon where one can cruise along by boat or raft, swim in 200 foot deep waters and soak in its mineral springs. The Rio Grande also offers bamboo river-rafting, where one can enjoy the tropical vegetation and bird life on the hillside on route down to where the river meets the Caribbean Sea. 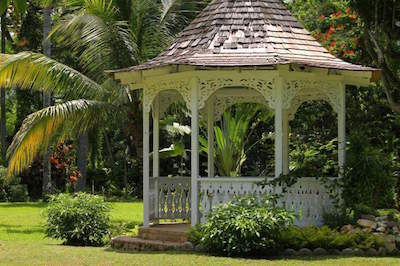 Rated one the most beautiful gardens in Jamaica, Shaw Park Gardens is the thing to do in Ocho Rios. Located atop undulating hills, this botanical garden offers sensational panoramic views of Ocho Rios and the Caribbean Sea. You don't need green fingers to appreciate the beautiful design of this multi-tiered garden landscape, with around 600 different flowering species and a plethora of indigenous trees and shrubs. An informed guide will help you spot the iridescent colors of the streamertail hummingbird, the Jamaican national symbol, believed them to have magical powers. At the base of the hill, the garden also boasts a majestic waterfall cascading through rocks into glistening pools, as well as the remnants of the old Shaw Park Hotel. If you're wondering what things to do in Ocho Rios and its surrounds, then travel a mere seven miles from the bustle and step into a hidden tropical valley paradise. In utmost harmony with nature, the enchanting White River Valley offers both tranquility and outdoor adventures. Take a stroll through the Village of Flowers, zipline through the canopies of lush greenery, or hop aboard a bamboo raft as you cruise down the river. Take a leisurely horseback ride, one of the best Ocho Rios activities, or stop off alongside the riverbank to St. Anne or St. Mary parishes to sample local culture. Before your exploration and adventure ends, be sure to pop into the White River Valley Park for shopping and dining on traditional Jamaican jerk cuisine. When you want to explore the Caribbean Sea and see all-of-the wonderful underwater world that surrounds Jamaica, then snorkeling is a great thing to do in Ocho Rios. You have a variety of snorkeling adventures to choose from which will take you to some of the ore beautiful coral reefs where you can view thousands of tropical fish in their native habitat. Snorkeling excursions can be a half-day adventure or you can choose a tour which has many components to make for a full-day of fun in the sun and the water. Sail along the gorgeous waters of the Caribbean Sea before jumping into the warm waters and you can relax on deck while you enjoy a cold beverage in between dives. Snorkeling is the perfect natural adventure for people who love the water and sun. And an added bonus is that you will probably visit one a secluded white or black sand beach while you are on your day of exploration. If you ever dreamed of bobsledding in Jamaica and remember the movie Cool Runnings, then the best thing to do in Ocho Rios for the whole family is to take a Jamaica Bobsledding Tour. Your 2-hour bobsledding adventure begins with complimentary hotel pick-up service or you can drive directly to the eco-park which is located at the top of Dunn’s River Falls. Once here you will receive a brief safety message before you sent off on your bobsledding adventure. You will feel your adrenaline rise as you race down from 700-feet along a winding 3,200-foot track. You will be amazed at the views from above Dunn’s River Falls which offer vantage points of the Caribbean Sea and tropical landscape as well as several gorgeous beach areas. 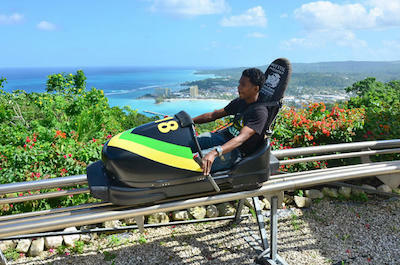 The Jamaica Bobsledding Tour concludes with drop-off service to your selected hotel. When you are searching for things to do in Ocho Rios and you are interested in the natural eco-system of Jamaica, then you need to go on an excursion to Konoko Falls and Park. The Konoko Falls and Park are a superb place to view nature and learn about the biodiversity of Jamaica as well as the island’s intricate history. 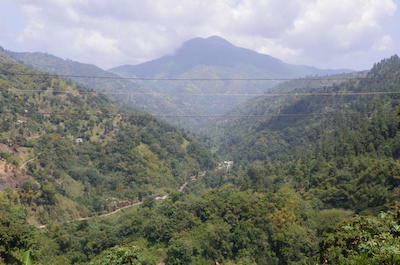 You have a wide variety of tours to choose from that will take you through this gorgeous jungle environment. Many of the tours to Konoko Falls and Park include side trips to special places like the Blue Hole as well as a scenic bike ride through Konoko Falls and Park. So when you are ready to view the native flora and wildlife, then you will be pleased with variety of selections you have when touring Konoko Falls and Park. If you like shopping a wide variety of venues then the Island Village is the ideal thing to do in Ocho Rios. Located directly across the street from the Ocho Rios cruise terminal, the Island Village is situated on 5-acres and is fashioned after a Jamaican village. As you walk the wood planked boardwalk you will thrilled at the assortment of the eleven shopping venues that include duty free stores like Casa de Oro, the Jewel Box and the Gold Mine which all specialize in jewelry. Other retailers within Island Village like Seaside Souvenirs, the Island Trading Jamaica Ltd. as well as Tuff Gong Trading boast unique souvenir items and you can find that perfect piece of clothing at Hemp Heaven or Cool Beach Stuff. The Island Village boasts great places to eat like Café Da Vinci for Italian, Island Coffees Boardwalk Bistro serves casual family food as well as Margaritaville grills up great burgers where you can also swim and play in the Caribbean Sea. If you want to watch a movie with the family then try the Cove Theater which ports 3D viewing. No matter what you are looking for in a shopping venue, the Island Village has something for everyone. If you ever wanted to visit the Taj Mahal in India and find yourself on the island of Jamaica, the most interesting thing to do in Ocho Rios for you is to go shopping at the Taj Mahal Shopping Center. Located on Main Street in Ocho Rios, the Taj Mahal Shopping Center resembles the beautiful Indian-style architecture of the original Taj Mahal. The Taj Mahal shopping Center has 26 duty free shopping venues that include respected retailers like Profumo for that special fragrance, the Cigar Planet for tasty Jamaican cigars, Cool Runnings for beachwear and the Gift Palace is a registered dealer of Harley Davidson, Red Stripe and Bob Marley merchandise. If you are looking for jewelry then browse Diamond Centre, Diamonds Forever and the Jewel Palace. Other shops include Andy’s Souvenir for Appleton Rum, Taj Gift Center for designer t-shirts and you can buy a jersey of your favorite Jamaican sports figure at Soni’s. When you need to rest and grab a bite to eat there are four restaurants that range from the Reggae Café with jerk specialties, Café Express has quick bites and Kriso Lounge and Wine Bar is ideal for just relaxing. The Harmony Hall Art Gallery is a superb thing to do in Ocho Rios when you are interested in viewing what is being created within the local Jamaican arts community. Located 4-miles east of Ocho Rios on the North Coast Highway, the Harmony Hall Art Gallery is situated in a beautifully restored Methodist manse which was constructed in the 19th century. You will enjoy the interesting art work that has been finished by some 100 local artisans and is exhibited throughout this magnificent building. Harmony Hall Art Gallery will please your sight senses with the creativity shown by the artisans which range from raw to very refined. You can browse the surrounding gardens or the gift shop where you will find the popular Annabelle Boxes being sold. When you get hungry or just thirsty for libation then stop by the Toscanini’s Italian Restaurant for a glass of wine or pasta. If there was ever a thing to do in Ocho Rios, getting a chance to interact personally with dolphins is ranked among the top 10 bucket list items. 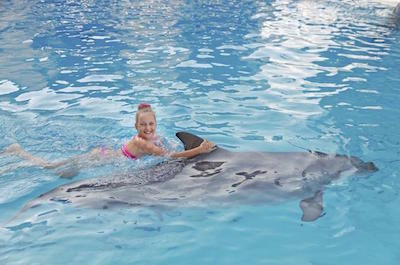 At Dolphin Cove, what makes the experience so special is that you'll be swimming and interacting with dolphins in their natural habitat, the Caribbean Sea. Let the dolphins kiss and snuggle you, and don't miss out on the thrilling dorsal pull and foot push experience. Other activities include mini-boat and glass-bottom kayaking rides, as well as interacting with sharks, stingrays and snakes. You can even be a sea-keeper for a day on the Behind-the-Scenes Experience. With so many amazing Ocho Rios activities to choose from, it's a marine experience par excellence! If you're up for a marine animal encounter like no other in the world, shark encounters at Dolphin Cove is the thing to do in Ocho Rios! Dispel the 'killing machine' stories of these fascinating sea creatures and overcome your fear under the watchful supervision of the trained shark encounter facilitators. This is a rare and thrilling opportunity to come into personal contact with the shy Caribbean sharks, also known as ÒSleeping SharksÓ due to their slow-motioned behavior on the sea bottom. In addition to swimming, holding and feeding the sharks, don't miss out on the very fun 'Pirates' Shark Show, interacting with stingrays and unique views of the marine life in a glass-bottomed kayak.